It’s not often I’m in the right place at the right time to see the birth of a new magazine. This time, I was. Shueisha’s Cocohana launched in time for January 2012 and I just happened to be at a store that carried it when it hit the shelves. Cocohana is being positioned as a Shoujo magazine for adults. As a result, the feeling is neither quite Josei, nor Shoujo, but some hybrid creation. From my perspective, it works. To bump up its appeal to an adult audience, Volume 1 started right off with a few power names on the roster, Higashimura Akiko (known for Kuragehime, known here as Jellyfish Princess,) with “Kakukaku Shikajika,” Yamashita Tomoko (Dining Bar Akira,) with a one-shot, “Biseinen,” and is reprinting some previously serialized stories from Chorus magazine, including Haruno Nanae’s classic Papa Told Me. (This gives me hope that, perhaps we’ll see her Pieta re-serialized. This story is one of my favorite older Yuri series and as the Yuri audience now exists as a thing on its own, I think Pieta‘s time has come.) “Ashi Girl,” by Morimoto Kozuek,o is the kind of fantastic mix of historical rewrite and female experience that I haven’t seen since Akaishi Michiyo’s Amakusa 1637. I’m looking forward to more of it. artists, something I haven’t seen any other magazine website include – despite the adoption of Twitter by many manga artists. The website also offers a personalized fortune-telling session, if you send your information in by form. Scheduled for 28 volumes a year, Cocohana retails for 500 yen ($6.44 at time of writing,) for approximately 450 pages, which puts it at the high end of per-page cost for a manga magazine…another sign that this is for an older audience. 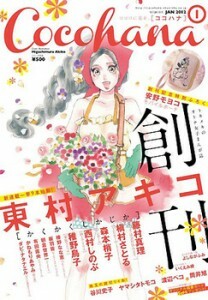 Bolstering the idea that the magazine is Shoujo, not Josei, it comes with a giveaway – a small purse – but, with art by Anno Moyocco which confirms that the audience is adults. So far, in image and story, Cocohana is balanced perfectly to present a specific image. This sounds amazing, really wish I could read Japanese now. Is it available in English?!? Japanese manga magazines, with the exception of Shonen Jump, are in Japanese only. You can order them through Amazon JP, BK1, J-List or Japanese bookstores (Sanseido and Kinokuniya are the two largest chains) in a city or a Mitsuwa mall near you. The joy of reading Japanese manga magazines is one of the many reasons learning Japanese is so much fun!